Neil Waterhouse, Multi Million Dollar eBay Seller, warns…. Read this page NOW to discover the #1 mistake people make selling merchandise on eBay – and how you can avoid it and make REAL money selling stuff on eBay! The secret to making a six or even seven-figure annual income on eBay is actually easy … yet not 1 eBay seller out of 1,000 has figured it out yet! Hello. My name is Neil Waterhouse. And right on this web page, right here and now, I’m going to reveal the one mistake eBay sellers make that dooms them to earning peanuts. And I’ll also tell you what you should be doing instead to make a LOT of money selling merchandise on eBay. You’ll learn this vital eBay success secret immediately, just by reading this web page – without buying anything from me. I’ll explain why I’m sharing this top-secret eBay information for free online … instead of charging you for it … in a minute. A word about me before I get to my eBay Profit Secret…. Short and sweet: Since 2002, I have sold millions of dollars of items on eBay from my home in Sydney, Australia. In 2009, eBay recognized me as one of their top eBay million dollar sellers. Today I run multiple eBay businesses. That’s all I think you need to know about me to decide whether to listen to my eBay advice. But if not, you can read a more detailed bio at left. They collect various items to sell on eBay, usually from their garage or attic. They may buy additional merchandise to sell online at flea markets and swap meets. Then they take a photo of each item, write a description, and post listing on eBay. Most of what they sell is basically junk that would otherwise get thrown away. Of course, every once in a while, they offer a real treasure. But not that often. If you run your business that way, you will never make much money with eBay. That’s because selling “one-offs” is slow and labor intensive: you have to create a new ad and photo for every new item you sell – and constantly scour your neighborhood for new items to list. It’s not a “repeatable” business because you are always reinventing the wheel. It’s not reliable because you never know what stuff you’ll find to sell. So how do you make real money on eBay – day after day, week after week, month after month – like I do? My method is to find one quality item … or a handful … that I know will sell briskly and in volume on eBay – which I do by testing. Once testing shows me that an item will sell, I find a source where I can buy as many units as I need at low wholesale prices – often from China. I take one photo … write and post one ad on eBay … then sit back and watch money pour into my PayPal account – on average more than $20,000 a week – as I sell the same product by the hundreds! Well, that’s what I do in a nutshell: find a select few items that sell great on eBay, then keep selling those few items over and over again at a good profit margin. At last, a step-by-step, do-it-yourself,guide to making money on eBay…. Today eBay is a huge e-commerce platform that’s practically tailor-made for work-at-home entrepreneurs like you and me; total annual eBay sales are $14 billion. 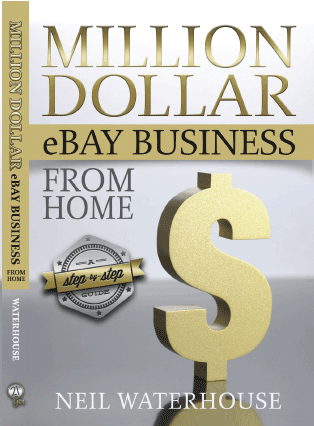 Now my book Million Dollar eBay Business from Home shows you step-by-step how to advertise products on eBay and sell them at a handsome profit. The 3 factors that determine how much money you’ll make on eBay. Page 27. How to find anything you want on eBay. Page 38. 3 ways to handle questions from your eBay customers. Page 96. How to increase your eBay profits by opening an eBay Store. Page 113. The worst eBay business – and how to make sure you stay out of it. Page 27. A simple formula for going from zero to a million dollars a year on eBay. Page 28. Tip and techniques for lighting and editing your eBay product photos. Page 60. Plus: how to digitally remove backgrounds from photos. Page 62. How to source quality merchandise at low prices from China. Page 46. 45 items you may have lying around that you could profitably sell on eBay. Page 29. 10 products people regularly throw away that others will buy from you on eBay. Page 31. How to sell other people’s items on eBay for a 5% to 50% commission on every sale. Page 32. How to find wholesale lots you can buy online and resell to others at a profit through eBay. Page 33. The absolute most economical way to launch an eBay business ever devised. Page 35. 5 places to find merchandise you can turn around and sell on eBay. Page 36. Where the real big money is in eBay marketing. Hint: it’s probably not what you think. Page 36. How to earn an average profit margin of 411% on new items you sell on eBay. Page 36. 17 situations in which you can get eBay to remove negative feedback of you as a seller. Page 107. Where you can find the most powerful button on eBay – and how you can use it to skyrocket your eBay profits. Page 37. Why limit your sales to the USA? Here are 22 countries that have their own eBay sites. Page 37. The secret to maximizing your profits on every item you sell on eBay. Page 40. The 7-step “arbitrage formula” for choosing new products to sell on eBay. Page 41. 9 questions to ask before you choose a market niche for eBay selling. Page 41. What product price points sell fastest on eBay – and which are too expensive for eBay shoppers? Page 43. How to take clear, crisp product photos for selling items on eBay—and why it’s so important to do so. Page 56. A simple process for researching which products are selling best on eBay. Page 44. Why you should NOT sell drop-shipped merchandise on eBay. Page 45. 10 tips for maintaining high feedback ratings as an eBay seller. Page 102. How to avoid being scammed when importing merchandise from China to sell on eBay. Page 47. How many different photos of an item will eBay let you upload for free? Answer on page 63. Using Google to determine the keywords that can bring a flood of traffic to your eBay listing. Page 76. Avoid selling these 17 items … because they are banned from eBay. Page 50.
find products meeting these criteria. Page 53. Do fancy graphics in eBay photos help or hurt sales? The answer may shock you. Page 54. 21 great tax deductions you can take when you own your own home-based eBay business. Page 64. How to open an eBay account in your own country. Page 67. How to enable your eBay buyers to pay for your products using PayPal. Page 69. 8 steps to becoming an eBay “PowerSeller” – and why you should. Page 70. How to ensure that your eBay account has 100% positive feedback. Page 99. How to list an item for sale on eBay. Page 74. Best words to use in your eBay listing’s subtitle. Page 79. The most powerful copywriting technique for creating successful eBay product listings. Page 82. 3 ways to get perfect studio-quality product photos with a perfect white background. Page 58. 7 ways to add a sense of urgency to your eBay listings. Page 82. 4 reasons you should never allow customers to pick up products they ordered at your house. Page 83. The best return policy to use on eBay. Tip: It’s NOT “all sales are final.” Page 84. The fastest, most cost-effective way to ship goods imported from China. Page 48. Where to store your eBay inventory. And: an easy way to prevent water damage of stored inventory. Page 148. What works best in item descriptions – text or HTML? Page 85. Best day of the week – and time of day — to finish eBay product auctions. Page 86. How to set your eBay product shipping fees. Page 88. Free software from eBay to help you save time and money managing your online business. Page 129. Little-known eBay trick increases the market’s price perception of your product. Page 133. How to double your sales by selling your eBay products on Amazon. Page 125. 3 steps to ensuring customer satisfaction with international orders. Page 89. 8 listing upgrades that make your eBay listings stand out from the crowd. Page 90. How to list products on eBay with your smart phone or iPad using their app. Page 92. The easiest way to keep track of what’s going on in your eBay Business – including total sales for the month, total items listed, and more. Page 93. 4 steps to getting dissatisfied customers to retract their negative feedback of you. Page 100. 9 ways to measure your business performance with the free eBay Listing Analytics tool. Page 139. Little-known secret to having a highly profitable eBay business. Page 141. 7 ways to get your eBay items to move more quickly. Page 142. Prevent “slapping” from damaging items you ship to your customers. Page 152. How to start with zero money, no borrow a cent or dropship! How much would you be willing to pay me to share my million-dollar eBay secrets with you – and show you step by step, in words and pictures, how I build a million dollar eBay business from my home from scratch? $1,000? $500? $100? It will cost you not even that! The cover price of Million Dollar eBay Business from Home is just $59.95, and that’s what we’ll sell it for later in the year. But when you order now, my Million Dollar eBay Business from Home is yours for only $19.95 – a discount of $40 off the regular rate – less than you’d pay to take a friend to lunch at the diner! And that’s only if Million Dollar eBay Business from Home helps you make money selling your stuff on eBay. If it doesn’t, then it won’t cost you a penny. Here’s why…. I totally guarantee your satisfaction with our new guide to making money quickly and easily on eBay. If Million Dollar eBay Business from Home doesn’t help you start generating sales of hundreds or even thousands of dollars a week on eBay within the next few weeks…. Or you are not 100% satisfied with Million Dollar eBay Business from Home for any other reason … or for no reason at all … just let me know within 90 days. I’ll give you a full and prompt refund. And you can keep the book with my complements. In my 21 years in business, I’ve tried and succeeded in a lot of things, and I also failed in a few. I got into computers early. I was one of the first ISPs (Internet Service Providers) in Australia. And I started and ran one of the largest computer hardware supply houses in Sydney. From 1997 to 2002, I imported and customized Dodge Vipers from the USA into Australia. 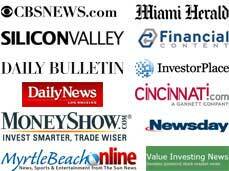 I also traded options, owned and operated vending machines, created and marketed information products online, and invested in real estate. But by far the most enjoyable and profitable business I’ve ever owned is my home-based eBay business. Buying low-priced consumer products from the low-cost sources I show you in Million Dollar eBay Business from Home … and selling them on eBay at handsome mark-ups … gives me both the income and the lifestyle I love: working at home with plenty of free time to spend with my family. Now I can’t promise you’ll make a million dollars a year on eBay. But even if you did, say, one-tenth the volume … that’d still be $100,000 a year in extra income earned on eBay. Not bad, right? 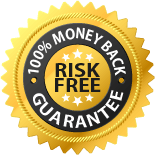 And remember: you MUST be 100% satisfied with the money you make from my Million Dollar eBay Business from Home program – otherwise, I’ll refund your money in full. You can’t lose! P.S. Order Million Dollar eBay Business from Home today and you get a FREE Bonus Gift – the popular Waterhouse Research eBay Cheat Sheet. The eBay Cheat Sheet is your “quick-start guide” to getting up and running on eBay in a flash. It condenses the most important eBay knowledge on two sides of an 8 ½ X 11-inch PDF available for instant download. Reading time: 5 minutes. Registration steps to get you started on eBay in less than 5 minutes. eBay policies and restrictions you ignore at your peril. 7 ways to easily sell your merchandise on eBay for the most amount of money possible. An at-a-glance glossary of key eBay terms. 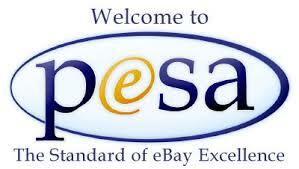 5 tips for purchasing merchandise to sell on eBay. Guidelines for taking great eBay auction photos. How to find out what any item on eBay sold for. How to select the right category for your product listings. Tips for maximizing profits at auction sales. 25 hot products you can sell on eBay that are making over 50% profits right now. Neil Waterhouse is an eBay Multi-million Dollar seller and a pioneer of the computer/e-commerce world. Right from school, he was the first in his high school to have a computer at home. Back in 1980 when the school he attended, Manly Boys High in Sydney, Australia, received their first computer, he was the one who taught the teachers how to use it. From there, he had his first part-time job at age 15 demonstrating Apple computers at Sydney’s Royal Easter Show. Neil has always worked on the cutting edge of the computer industry. He was one of the first Internet services providers in Australia, and an e-commerce web site of his became one of the top 2,000 sites on the web. In 1991 he started Cam1 Computer Wholesale, which became one of the largest computer hardware suppliers in Sydney. Neil was also a pioneer in Internet marketing, and one of the first to generate over one million dollars in sales from home on the Internet. 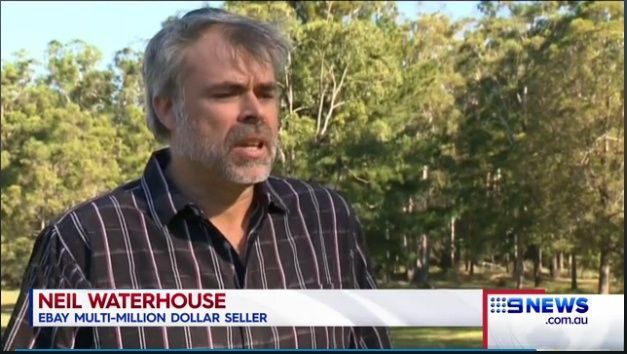 Starting in 2002, Mr. Waterhouse has sold millions of dollars of items on eBay from his home in Sydney, Australia. In 2009 he was recognized as one of the top eBay sellers and was invited by eBay to speak on the eBay Top Rated Seller Panel. Neil is also the founder of Waterhouse Research, which is the world’s largest research company that specializes in finding high-profit products for eBay and online business companies. Neil not only studies the eBay and e-commerce industry; he is an eBay recognized multi million dollar eBay seller running multiple eBay businesses. He just doesn’t talk about eBay and teach the industry; he lives it every day. 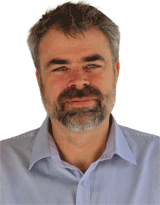 Neil is also the founder and host of the Sydney, Melbourne and Brisbane eBay Seller Meetup Groups where he regularly does presentations to help other eBay sellers. 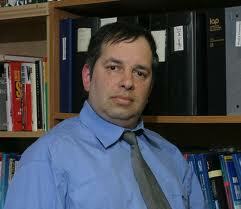 His mission: to help as many people as possible earn a handsome living on the Internet working from home. And eBay is his favored vehicle for achieving that goal. Neil’s wealth of eBay knowledge has been recognized by many of the top e-commerce businesses in the world where he has been an “invited” guest speaker. 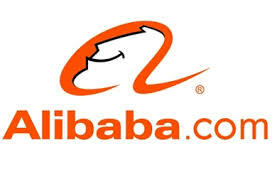 These include eBay, The Professional eBay Sellers Association (PESA) and Alibaba. Neil lives in Sydney Australia with his wife Nicole and has four children. I really enjoyed this book – I needed information and this book gave it to me in a form I could understand. I found it was clearly written with all the answers to the questions that had been eluding me. I recommend it to anyone as a good guide to starting an eBay business from home. Buy it – you have nothing to lose and a potential business waiting for you!!!! This book is very informative with detailed information on setting up and managing an Ebay business. I would recommend this to anyone interested in starting an Ebay business. Read the book from cover to cover. Tried the techniques used, and they really work. 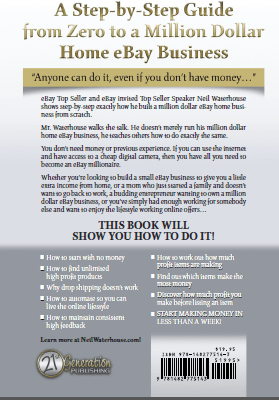 I plan to start a part-time business, based on the material in this book… An excellent read. I wasn’t familiar with how to even use Ebay. This book was very enlightening on all aspects and a great how-to step-by-step with excellent advice on what not to do. This book has opened my mind to the great ways of business on the web. It mainly focuses on ebay sales and it is awesome. Putting all of the ideas to action will definitely help your business.